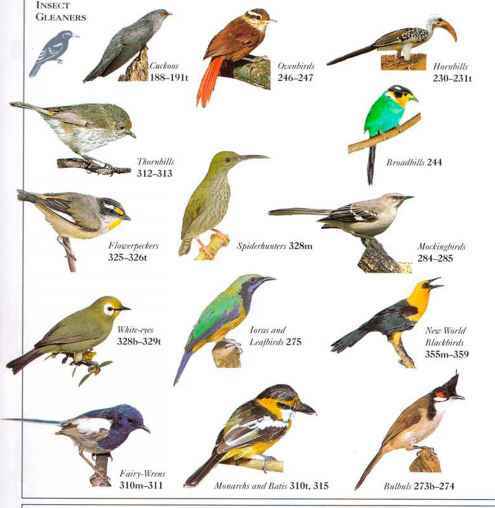 1'his stoutly built bird, resembling thick bill • a woodpecker, lives in tropical and probes into mountain forests. 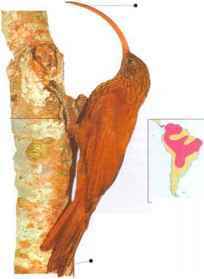 Often solitary, it is moss and usually seen climbing up tree trunks leaves and larger branches. It feeds by-probing for insects in crevices feet with on tree trunks and branches, " wide as well as hunting them in the grasp foliage. Strong-billed Woodcreepers also descend to feed on or near the rain forest floor. Here they sit and watch army ant swarms from a perch, swooping to the ground to prey on the insects disturbed by the ants. 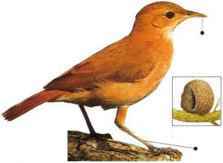 A slender, woodpeckerlike bird with a long, downward-curving bill, this species climbs the trunks and larger branches of trees, probing under bark and into crevices and inside the flowers of bromeliads for insects. It occurs either in rain forests or in sections of swampy woodland surrounded by open country. The Red-billed Scythebill is a sociable bird, often seen among flocks of mixed insect-eating species, each one feeding in its own fashion. 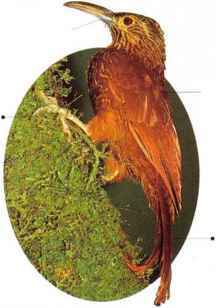 • NEST A cup nest made of plant materials, usually built in the hollow of a broken-open stump. • DISTRIBUTION From Panama through lowland South America to N. Argentina and Paraguay. • REMARK The five species of scythebill all belong to the woodcreeper family, most of whose members have long, sicklelike bills for probing into crevices and pulling out prey. Scythebills have the advantage of a very long reach to search deep inside large flowers and capture insects that hide there. Slim and long-logged, this bird is adapted to living on the ground in open grassland. It is frequently seen probing the surface litter for invertebrates. • NliST A domed mud nest on top of a branch or pole, resembling a bread oven - hence the Spanish name el hornero — "the baker." • Distribution Open lowland in southern half of South America.